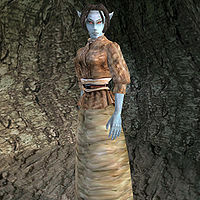 Falura Llervu is a Dunmer slave who can be purchased at the Slave Market from Savile Imayn in Tel Aruhn. (She's also one of the only Dunmer slaves in the game.) 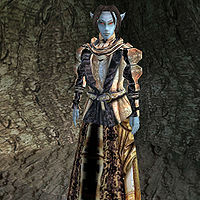 With a nice change of clothes and some Bug Musk, you can try to fool Kaushad, Ashkhan of the Zainab Tribe into thinking that she's a high-born Telvanni lady, which will earn his support during the Zainab Nerevarine quest. Falura only appears during her related quest. There is also a game bug that causes for her cage door to not open. Zainab Nerevarine: Travel to the Zainab camp in order for them to recognize you as the Nerevarine. This page was last modified on 16 November 2013, at 22:36.